World War II is the tone of tension imbued with freedom. Fundamental to Americans’ sense of themselves as individuals, and as a nation, is the idea of freedom. This central term in American vocabulary is deeply embedded in the documentary record of the nation’s history, language, and everyday life. In 1941, Roosevelt famously defined the elusive word in his Four Freedoms speech, where he proposed that people “everywhere in the world” ought to enjoy freedom of speech, freedom of worship, freedom from want, and freedom from fear. It was also during the very same year that the Japanese made a surprise attack on Pearl Harbor, an event which officially catapulted the United States into World War II. To the American people, December 7th, 1941 is a date, which lives in infamy, for better and for worse. The idea of freedom supported Americans, both overseas and on the homefront, throughout the duration of the war. In their righteous might, the people triumphed over all adversity, and saw their efforts through to absolute victory, conquering their wartime foes for the cause of freedom. World War II is a place of tension and uncertainty, where the dissolution of preordained notions of everyday life serve as salient reminders of war’s unexplained nature. In a world ravaged by oppression, World War II is a place which embodies the Four Freedoms, where The Everyday is colored by a booming war economy, price controls, war bond drives, victory gardens, rationing, the rise of women in the labor force, and unswerving acts of courage under pressure. 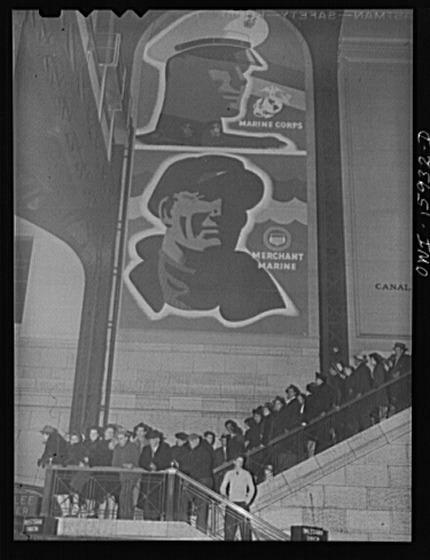 We give thanks to the Government's nationwide propaganda campaign, and especially the Farm Security Administration and Office of War Information, for popularizing and documenting the war effort, on the homefront.